Cat Christmas Sweater: (Target) but a gift from my grandma. Red Dress (worn underneath): Modcloth. Black Flats: c/o Pink and Pepper. Tonight I am excited because I'm going to the NAV Christmas party. And not to mention it IS and ugly sweater party so it was time to break out my 'ugly' (not in my book) cat sweater! I love this sweater and wish I could wear it every day in December. It has little velvet bows on the bottom and on the cat's collar even a tiny bell that jingles. Gram, I know you're reading this and this sweater is the best gift you've ever given me! Hope you all have a beautiful start to your weekend tonight! That sweater is so ugly it'd gorgeous. My boyfriend was going to buy it for me as a joke for out anniversary a few weeks ago, but he realized I liked it, so he didn't buy it. This outfit is darling, and the snow in your hair is gorgeous. This is so adorable and festive! I love your quirky cat sweater. This is the best time of the year for silly sweaters. I actually think you styled it wonderfully with those awesome tights and over your pretty red dress. LOVE this outfit! you look beautiful lauren! whats better than a cat sweater? NOTHING! I think that sweater is utterly ridiculous... in the best of ways! Love the little peter pan collar. And the close-up picture of you with snow in your hair - beautiful! You are a sartorial GENIUS, Lauren!! I'm so serious. Always so inspiring. This outfit is amazing! I am obsessed with your tights! That sweater is so cute! I've never really had a chance to do the whole Christmas sweater thing as it's summer over here! 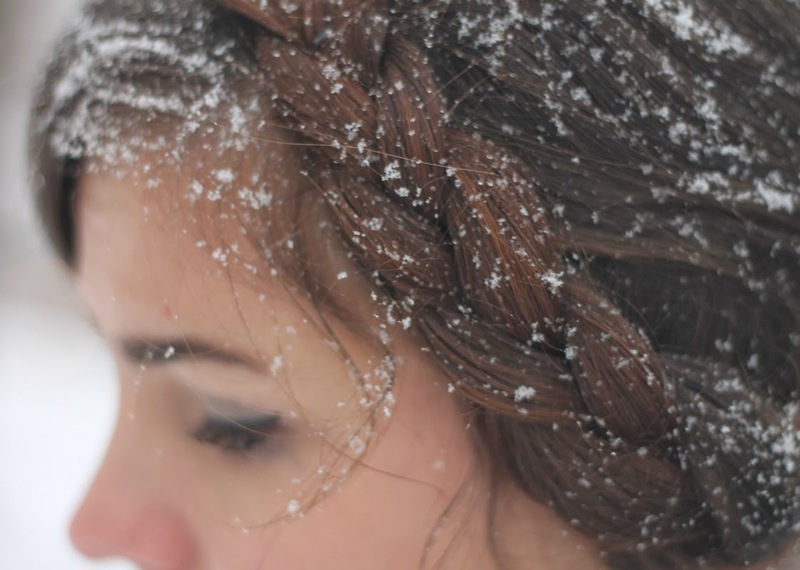 The third picture of you with all the snow in your hair is probably the most beautiful I've ever seen of you. These photos are SO gorgeous, and I love that you layered this dress under the sweater! Such a great outfit, and the snow is stunning! You look adorable :) These pictures are so magical with the snow too. That sweater looks absolutely adorable on you! You're definitely able to pull it off. I love how you styled it as well! You look lovely! I love this outfit!! I love shorter skirt with the sweater! Adorable! You look like a snow angel Lauren! 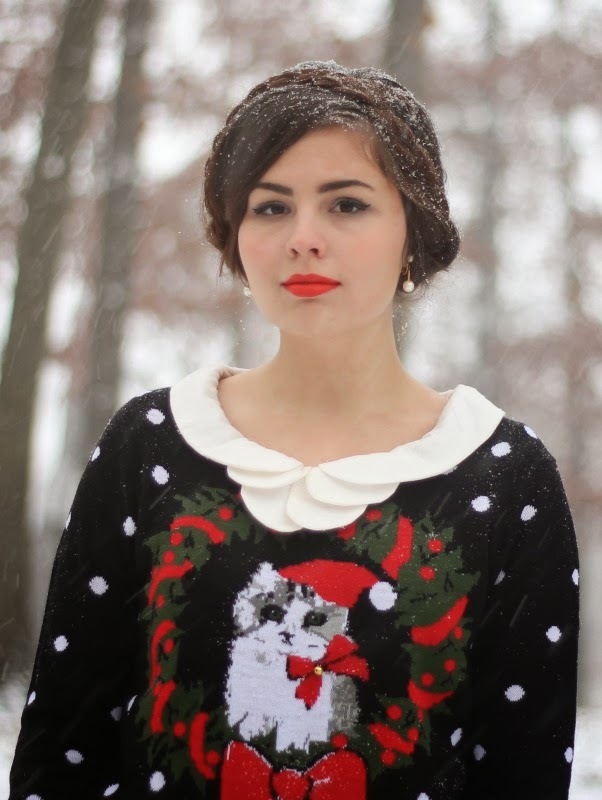 And the jumper is so gorgeous, your grandma has an amazing eye for cute things! Such a cute little post. Jumper is so christmassy! 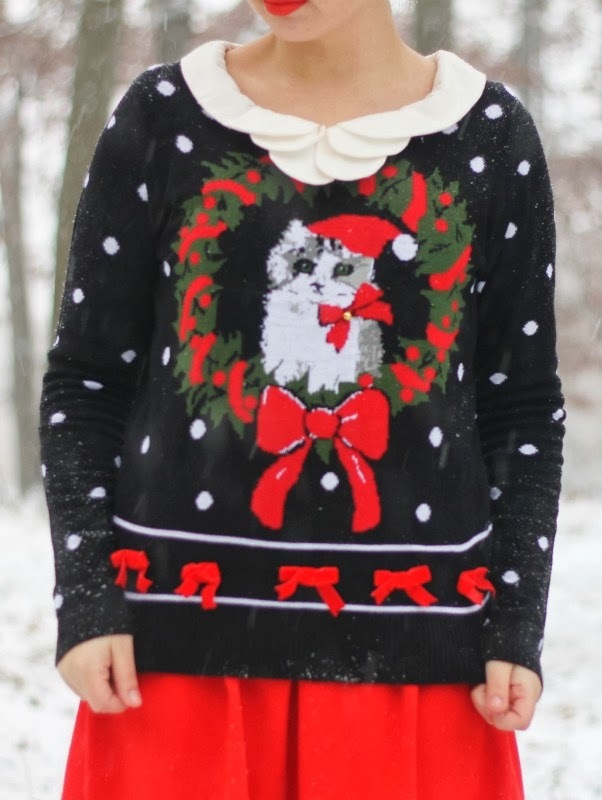 this is the cutest Christmas outfit I've ever seen! you look lovely, girl! Cute outfit, and you look like an absolute princess with the hair do and the snow. Cutie! Look at that smile!!! Is there a tutorial for how you did this sort of relaxed maiden braid look that you can link me to? This sweater is just so perfect!